This “Field Guide” (at www.ZwemerCenter.com) explains 9 must-knows for ministry in honor-shame societies, especially Muslim contexts. Muslims live (and die) for honor. Guilt and shame are two different cultural/moral systems. 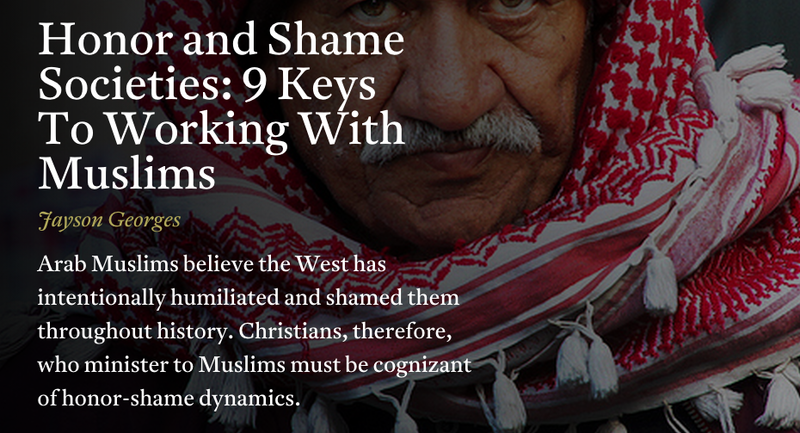 Shame is not just an Arab or Asian characteristic. The Bible is an honor-shame book. God cares about the honor of Muslims more than they do. The Bible speaks about sin in terms of shame and dishonor. Shame is a major reason Muslims reject Christ. Evangelism should include relational and communal language. Sharing a meal is a great ministry strategy. The Zwemer Center for Muslim studies (hosted at Columbia Int’l University) recently launched its website. The interface is excellent, and the content is equally impressive. It’s a great resource of understand and blessing Muslims; check it out.